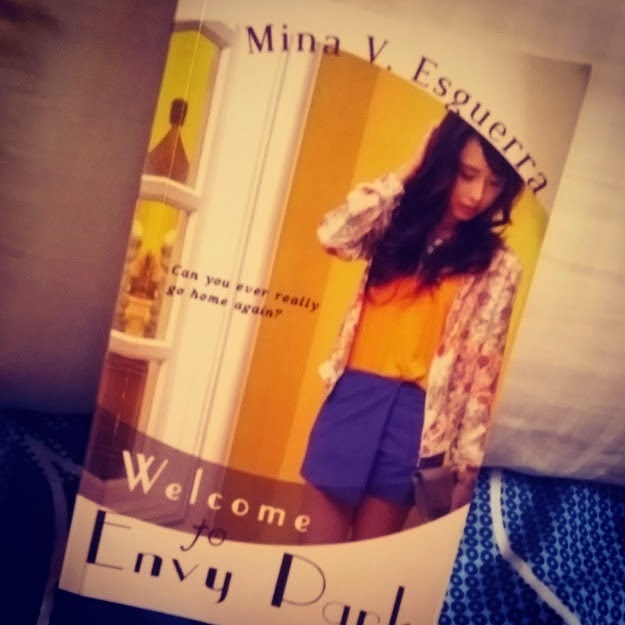 Finally finished reading "Welcome to Envy Park", written by Ms. Mina V. Esguerra. I have always followed her website, and listened to her podcast, so during one of my trips back to Manila, I managed to pass by a bookstore and purchased 3 of her books. (When it comes to books, I'm a real hoarder because I just keep on buying even if I have only probably read 20% of my books.) Sigh! I'm really trying to get back on track, but indeed juggling a full time job, a Facebook page, writing books myself, plus of course being a housewife IS already difficult. Honestly speaking, I don't really read this kind of book genre, or maybe I did at some point in time, but it has been a long time ago - when I was under 20 years old - so I was not really feeling it at the beginning. The book tackles about quarter life crisis of the protagonist named Moira. The setting of the story is in Manila so it is not so hard to imagine since I have been there recently, and I know what it is like. We were let into Moira's mind, a woman in her mid 20's having goals and likes to plan ahead for the future. She likes to be in control of her life, and most of the time compares herself with the people she met. I can definitely relate to the character being in my mid 20's myself. One way or another, I felt the same way, however I can feel that she focuses so much on herself as she does not really think or tried to ponder what were in her friends' and parent's mind or what were their feelings. 1. What do you know about mid-life crisis? Do you think it's a legitimate stage one might go through while in their twenties? I personally experienced mid-life crisis just before I turned 25 last year. It was an awful experience, I got really depressed. I was clueless on what is going to be the next stage of my life at that time, I was ready to leave work and just be a bummer for a while. Eventually, it didn't happen, my mind cleared up and after a few months I managed to release a book co-written with my friends. My husband did experienced it and he reacted in an entirely different way (I wouldn't go through the details), but yes I believe it is a legitimate stage you might go through. 2. Have you ever lived in a condo building? Do you know who your neighbors are, and what they do? I do live in a flat on the fifth floor and this is apparently my 4th crib. I do hate moving but flat rent in Hong Kong is ridiculously expensive. Unfortunately, I do not know any of my neighbors so I ended up imagining who they are with what I can see. It's not that I am not friendly, but they are not friendly either - downside of living in a condominium in Hong Kong - boooo! I will rate the book 3/5, and I do look forward for Roxie's story, I think it's going to be more interesting with Peter. She seemed to be the person who can't get over with an ex. While reading the book, I get to like Roxie's character more than Moira. She seemed kinder and more compassionate because she loves her parents. That will be all from me today folks! I didn't know the author but she sounds interesting. Is she a filipina? I bought a lot of books too, but more on educational or inspirational that I also haven't read yet. I would like to read English stories with Manila as settings since I live in the province, i don't have an idea what kind of life the typical people have there. I'm not sure if book clubs exist in our place.